The last operation before cutting is to mark the notches at each corner of formers except No. I, into which, fit the longerons during assembly. formers. Cut to length at rear ends, but not front ends until after assembly. Mark number of former to be fitted at each point. The next operation is to fit the longerons to formers. Various methods may suggest themselves, but the writer has found the following method best: -Screw or clamp a piece of wood about 1 in. square on to the bench, and allow an overhang of 24 in. Make a 1 in. radius on one edge. Now thread formers number 3, 4, 5 and 6 in order on the bar, keeping the numbered corners the same side, and either facing front or rear. Pierce longerons at centre of points marked on them, and drive a 1/4 in. pin just through, Take each former in turn, and glue and nail longerons in slots, using the I in, square bar as the anvil, supported with left hand. 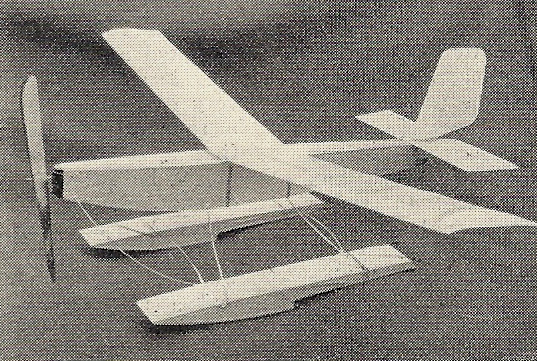 Glue and nail all four lorngerons in position at one "sitting," and when completed, before glue is set, lay fuselage upside down on flat board, with three small weights distributed'. along its length, over the formers. When dry No. 2 former and rear plates, items 1 I and 12, can be fixed. Finally, when glue is set, cut off longerons flush with No. 2 former, glue and nail former No. I, rear struts and stern post in position, also at this stage fix in packing blocks. Check fuselage for being true, clean up, and round off sharp corners of longerons, etc. Make up undercarriage fittings, item No.3, and fix, after which glue in compression struts, item No. 5.
section ribs before assembly. Mark out positions of all ribs on spar, leading and trailing edges.